We realized halfway through yesterday that we really hadn't had a nice date night/day/activity in a while and resolved to do something to fix that soon. Sure, staying in and cuddling on the couch was nice, but we always do that and we want something that'll feel special. I went to bed around 11. The next morning I got up fairly early and spent some time maintenance cleaning - dishes, laundry, trash, general tidying, etc. It still amazes me how cluttered our place can get in such a short time. Michael got up and showered in time for us to head on post for my Hanji class! Michael originally was just coming to get out of the house and he was going to be the one in charge of taking pictures. We got to the class 10 minutes early and S, the volunteer running the class, didn't arrive until about 10 minutes after it started. I think the man who was essentially the keeper of the arts & crafts room had to call her and tell her "oh my goodness someone's actually come to the class!!" It turned out that Michael and I were the only ones that showed up. Good thing Michael was there! I'm not sure how I would've felt being there all alone for my first time. Michael was the man in charge of pictures at this event so he... well, took charge! That black drawer thingy with white, red, blue, and green drawers is what I chose to make. Here you can see some finished projects as well as projects in action. The stack of white box looking things above the hexagon shaped container is three separate projects like the one I picked. Another project. It looks to be a tray of sorts. The table that we worked on. Since it was just Michael and I he decided to take on a project of his own as well! Clay table! Apparently I missed out on some ceramic classes by about a month. Bummer, because I would have loved to make myself the largest coffee/tea mug ever. Washing station, as every good arts & crafts room should have! Another angle of the magic Hanji table. This was my project all packaged up and ready to tear into. This was Michael's project. He picked a table, which you can kind of see in the bottom left picture of that 'instruction' paper. Michael's project, all taken out of the bag. My project, with S's hands as she's showing me what needs to be done. We had to use some special white wood glue and masking tape to get the parts to stay together until the glue dried. Here S is demonstrating what this particular piece should look like when put together. This is the base to Michael's table all put together. I'm working on the drawers, with each of their housing units standing up and drying. Blurry picture, but Michael was making fun of how dainty I was being with the brush and glue. Such dainty painting. Also it was kind of necessary since I had smaller surfaces that needed the glue compared to what Michael needed. To attach the top, Michael went for the harder stuff and used a hot glue gun. You can kind of see the line of clear glue where the base meets the top. More painting, and here you can see how I needed to use masking tape to keep the pieces together until the glue dried. This is Michael's project, completely put together. He made fun of me for not finishing my project in the same time he did. He got started on choosing and cutting out a design for his project while I just barely finished putting my project together before this particular class ran out of time. Putting some more masking tape on and using a ceramic mold's weight to keep the entire project together. Michael's design he picked out. The next time he comes into class he will be cutting out the rest of this design to use on the top of his table. My 'finished' project. I wasn't supposed to put the knobs on just yet, as I still need to adhere the decorative cloth/paper to this project, but I wanted to do it to see how it would look. At this point we'd run out of time so it was time to say goodbye to our beloved projects and head home. We got home and got ready to go into Yongsan and go to the mall, possibly see Deadpool. We weren't entirely sure as traffic can be a major factor in anything we do in Yongsan. A mall that we always see driving from our home to Yongsan. One day we will stop by and see what they have to offer. The mall! Today we decided to park in the mall's parking garage since we knew we were going to spend some money on some stuff and weren't concerned about paying for parking. The side of the building is always covered in posters. The parking garage! Everyone backs into their spots here. I can see why, after we tried pulling forward into a spot the first time we came here. It's actually more space efficient to just back in. I didn't take too many pictures while in the mall. We went to a lot of the same stores I've already taken pictures of. We met up with one of Michael's friends, M, at the mall. Deadpool wasn't showing until much later and since Michael works tomorrow we didn't want to stick around and keep him up late. 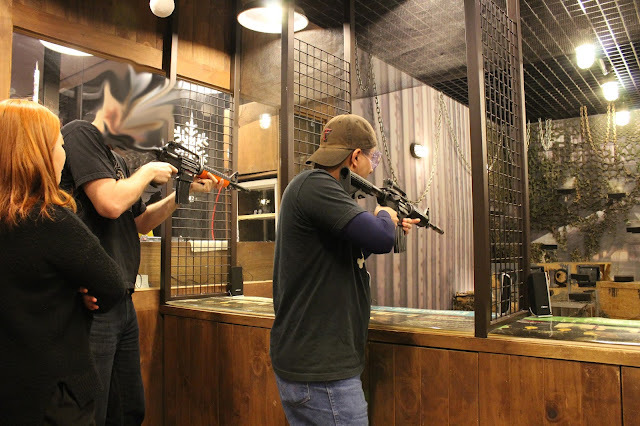 In the movie theater is an air soft shooting place, so M and Michael had some fun shooting. Choose your weapon! It was 9,900W for a 60-shot game. Now prepare yourself for rather repetitive pictures! The entire 'shooting range.' M and Michael got to use the two leftmost lanes. The top of the range had some hanging chains. I thought it was an interesting aesthetic. The boys in action, with the employee helping us understand what the game was screaming at us. ("round ___", "reload", "break time", "you ran out of bullets!"). Michael 'won' the game because he conserved his ammo better and also got more hits from what I could tell. Overall a fun experience for the both of them and relatively cheap. After this we went home. Michael went back out and had dinner with M and another friend, but I was wiped out. I stayed in and had some canned chili. I'm pretty exhausted, so I apologize if this post is rather short. If you have any questions about my day feel free to ask and I will answer them to the best of my ability! Tomorrow I have a pretty jam packed day, so I'd better get off to sleep. I can't wait to see your finished drawers! I think it will turn out super cute. Michael's table is cool too. You are lovely! Glad you posted pics of yourself. HAHAHAAA!!! Yeah. Maybe I do. Whatzittoya?! I've gotten so sucky at leaving comments but I *AM* still reading! Hey, I see the stats on my end so I know my posts are at least being read :P I'm surprised at how long I've been able to keep up on commenting and replying! I've never been good at this stuff.